Il Colombaio is an historic Tuscan property located near Montereggioni in the province of Siena. The property has historical records dating back to the 1800′s and in 1897 was awarded an honor for its wine. An organic practicing farm, the soils are the famous Chianti ‘galestro’. Galestro is the Italian name for a special soil comprised of loose marl and limestone. The vineyards sit on 15 hectares with the rest of the 70 hectares being planted with many olive trees. 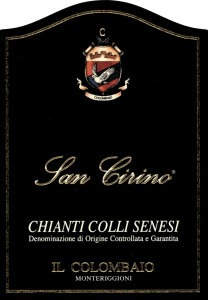 San Cirino Chianti Colli Senesi D.O.C.G. "San Cirino" (Saint Cirino), Chianti Colli Senesi D.O.C.G. (Chianti Sienese Hills, Controlled and guaranteed designation of origin), where Sangiovese regains the authentic complexity that has made it internationally famous, aged in small oak barrels, conveying an appealing spiciness while maintaining the character of the grape-variety. WINEGROWING CHARACTERISTICS: The vines are trained using the Guyot and spurred cordon techniques, the soils are clay-loam. The bunches are thinned in August. GRAPE YIELD/Ha: 5-6 tons of grapes per hectare. GRAPE HARVEST: October. The grapes are harvested by hand into crates. VINIFICATION: Alcoholic fermentation takes place at 28°C with daily delestage. The maceration phase varies in duration from year to year. AGEING: 6 months in small oak barrels. TASTING: It offers the nose delicate aromas of sour black cherries, violet, currants and strawberries. Smooth, balanced and full on the palate. SERVING SUGGESTIONS: First courses with meat sauces and meat-based main courses, barbecues and mature cheeses. 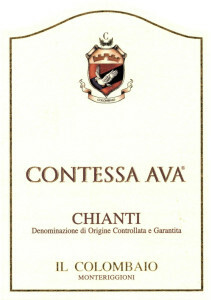 "Contessa Ava" (Countess Ava), Chianti D.O.C.G. (Controlled and guaranteed designation of origin) 100% Sangiovese, is decidedly innovative, thanks to a particular maceration process that extracts the unmistakable fruity aroma, guaranteeing an extraordinarily smooth taste and volume. WINEGROWING CHARACTERISTICS: The vines are trained using the Guyot and spurred cordon techniques, the soils are clay-loam. GRAPE YIELD/Ha: 7 tons of grapes per hectare. VINIFICATION: Alcoholic fermentation is preceded by a short period of cold maceration at 6°C to extract colour and aromas. Alcoholic fermentation takes place at 25°C, with daily breaking up of the cap and pumping over. AGEING: the wine is kept in temperature controlled stainless steel tanks until bottling. SERVING SUGGESTIONS: First courses with meat sauces and meat-based main courses. Also excellent as an aperitif or with fish dishes featuring tomatoes.